Blossoming Daydreams: FOTD With W7 Cosmetics! I wanted to try something new today and it occurred to me that I've never done an FOTD before. I completely underestimated how much work goes into these posts but never the less it was fun and I'll definitely be doing more if you lovely lot find it interesting. They were so kind and sent me a box of goodies including a mascara, a lipstick, a concealer palette and 3 corrective concealers. I wanted to have fairly natural makeup- clear skin and lengthy lashes and I think the bright summery pink lipstick brought the look together. I think this look would be fab for festivals, it's super easy and doesn't require a lot of makeup or time. The eyeshadow I'm wearing is from a collection palette, a review of it will be up very soon! This is a plastic brush mascara. The brush is oval shaped and quite chunky. I really enjoyed using this. Using this made it easy to coat every lash and on the first coat my lashes had a long, fluttery appearance and on second coat, they became more full and dense. It's definitely build able and I will use it whenever I want a quick fix of black lashes. This is a creamy concealer palette with 5 different shades. It includes a double-sided brush which is quite small and handy if you just want to target a specific blemish on your face. With me having such a pale complexion, I thought that only one of the colours would be suitable however the concealers are quite sheer and silky making them easily bendable which meant I could use all 5 shades. These are all low- medium coverage and I find them useful to wear underneath my foundation on the most discolored areas of my face in order to provide a good starting base for the rest of my makeup. I actually used one as an eyeshadow primer today and it worked really well. This lipstick is without a doubt a dupe for Macs 'Candy Yum Yum' it is highly pigmented, I applied some lip balm before this in order to tone it down a little. The colour is definitely fluorescent when worn on its own. I like that this lipstick has blue undertones which help make the teeth look white and although it is bright, I find it quite wearable- especially for the summer time! The purple one is used to cancel out yellow tones, the green one is to cancel out redness and the yellow concealer is used to cancel out dark under-eye circles. I have to admit, I found it pretty disconcerting to be applying a range pastel colours onto my skin but once I blended and applied foundation, I could really see a difference. This created a good base for my foundation to go over the top of. Once my makeup was done, I could see that my skin appeared far more even toned and clear. This is probably not something I would do everyday due to the time it would add onto my makeup routine but for a special occasion/ on a bad skin day, I will be reaching for these. So there we have it, my first FOTD and some little reviews. 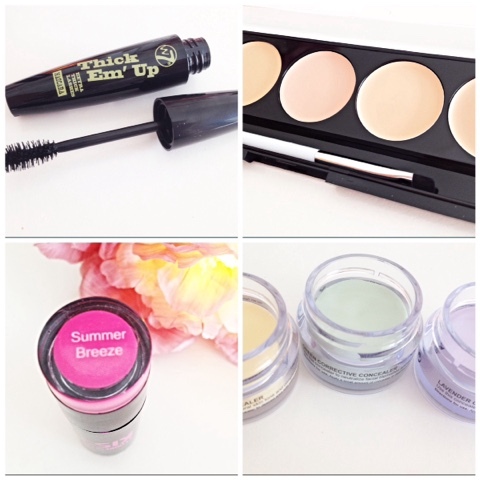 I love the look of those colour correctors! I really like this post! The look you created is really nice, and the lipstick looks amazing! I'd love to see more of these posts in the future :) and the reviews are quite useful, since W7 is an interesting brand considering its price! You look lovely! I haven't tried any W7 products before! I'm interested in the corrective concealers especially the under eye one! Love the photos <3 never tried any products from this brand before going to have to try some out! great look! Such a pretty look! I've never done a FOTD before, but I'd take your word that it's hard work; the things we bloggers do. :') You look beautiful, and I love your floral crown! I love the brush on the mascara!